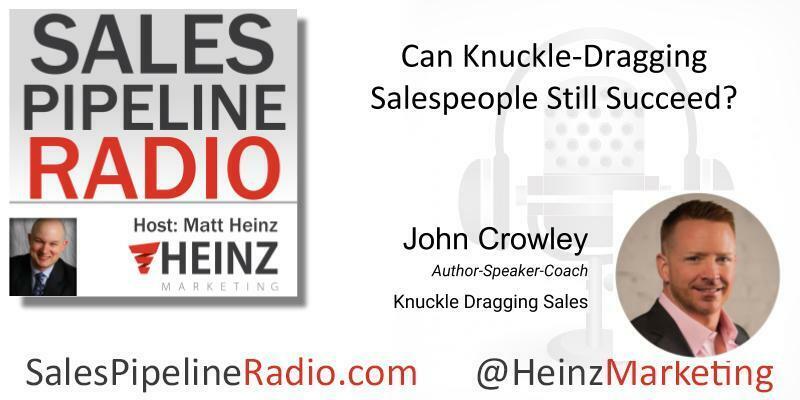 John Crowley in this interview with host Matt Heinz said “We live in a Jetson world, but it is the Flintstones that are Winning.” John is referring of course to the subject of his best selling book, Knuckle Dragging Sales. Crowley is co-founder and creator of the Knuckle Dragging Sales System. Author, speaker, mentor, coach and just a Knuckle-Dragging Sales Guy, John and Matt discussed what drove him to write the book and create a system that is not fraught with the usual sales gimmicks, shallow tips and tricks. How salespeople are getting distracted by tips and tricks from books and podcasts, but ignore the basics of a professional salesperson. John explores evergreen sales skills that must be learned and relearned to be successful in sales. How technology is not always the complete liberator that it is supposed to be in delivering tops sales performance. Why human interaction is the cornerstone for successful sales. How no one in sales can completely succeed without delivering value to the customer for the entire sales cycle. Why a strong sales mindset is the basis for success that cannot be ignored. Want to have John Crowley at your next sales meeting? Go here.